The dinosaur eventually has to give in, and Hal demands an apology from him. The creature also has to clear up the dreadful mess that he has caused in the garden. When he has finished, he timidly states that he is still hungry. Hal’s generous mum presents the dinosaur with a huge dish of spaghetti and meatballs, which he devours greedily. After a resounding burp, the dinosaur thanks the family, and runs away. Hal is praised by his mum and dad for the heroic way he handled the situation. 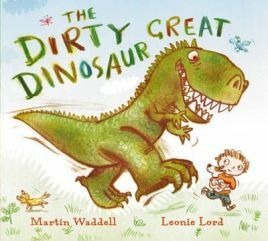 Martin Waddell has packed his story of The Dirty Great Dinosaur with plenty of entertainment and imagination. Young children will love the way that little Hal stands up to the huge, threatening beast and takes no nonsense from him. It is of course a picture book that is pure fantasy, but the excitement and heroism are bound to appeal to young listeners or readers. There is more than the average helping of humour here too. The majority of pages have just a small amount of text, and this often takes the form of a dialogue. The font is a medium size, but some words and phrases are enlarged for emphasis. The text is superimposed on the illustrations and is on either a white, yellow, pale red, pale blue or pale green background. The dinosaur repeatedly says “Grrrrr!” and then “Slurp!” while he is eating. When the spaghetti has all gone, he lets out an almighty “Burp!” which is printed in huge letters. There may be some families who will disapprove and would rather not risk their children copying his bad manners, so be warned. The rest of the vocabulary is straightforward, so very young children will have no difficulty understanding the story. Young independent readers will probably enjoy it too, especially if they are fans of dinosaurs and like humorous stories. The illustrations for The Dirty Great Dinosaur are by Leonie Lord. Picture books often have very polished illustrations, but Lord’s are quite sketchy. There is a great deal of pale green grass in the backgrounds and the dinosaur is a deeper green; sometimes the overall look is rather insipid. Lord does introduce light red, blue and yellow here and there, but there does seem to be a lack of intensity. Children, however, are bound to enjoy the comical expressions of Hal and the dinosaur which bring the story alive. The Dirty Great Dinosaur is not an exceptional picture book in terms of story, language or illustrations, but young dinosaur fans are still likely to get plenty of enjoyment from it. Parents who don’t want to encourage slurping and burping may wish to steer clear of it, while others will just see it as good harmless fun for children. Overall, it is an entertaining book to read aloud to children aged two and up. Older siblings may well find it a story that appeals to them for independent reading too. No Comments on "The Dirty Great Dinosaur"